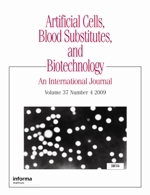 Artificial Cells, Blood Substitutes, and Biotechnology covers research and application on four structural levels: molecules, cells, tissues and organs, emphasizing artificial cells, blood substitutes, tissue engineering, stem cells, bioencapsulation, cell therapy, gene therapy, drug delivery and other biotechnological approaches. The addition of biotechnology, nanotechnology and molecular biology to polymer chemistry, engineering and medicine has revolutionized this field resulting in rapid developments. This journal is organized in a form to emphasize this modern and futuristic approach. It is an attempt to integrate biotechnology, nanotechnology, molecular biology, bioencapsulation, polymer chemistry, engineering, medicine, clinical applications and industrial applications in the development of artificial cells, tissue engineering, artificial organs, blood substitutes, cell therapy, gene and drug delivery systems, bioencapsulation nanosensors, nanodevices and other areas of biotechnology.